This dish is so hearty and soothing on a cold winter’s day. 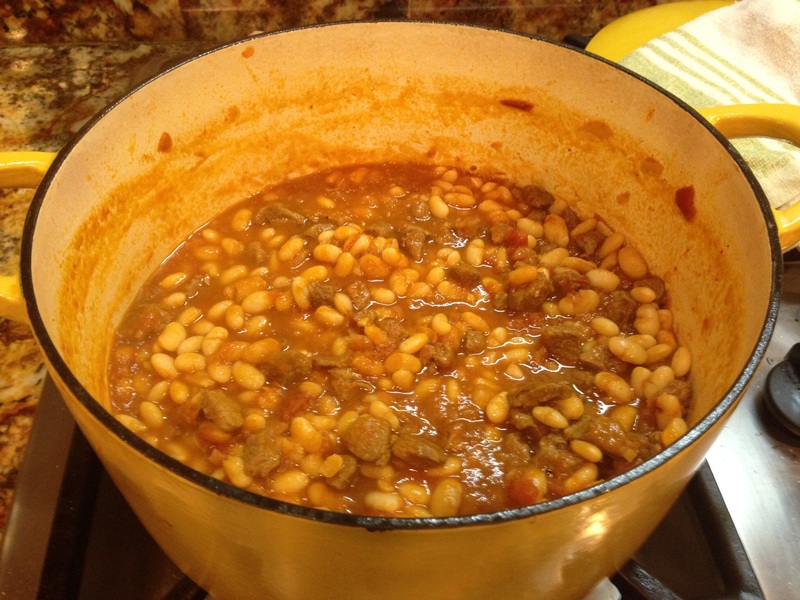 It’s a simple dish to make, but you need to be sure to soak the beans over night. I serve this dish with rice, along with a quarter of an onion per person. I admit that I actually use the onions like a spoon for the beans! It’s delicious, but you don’t want to be around anyone afterwards. Besides the soaking time for the beans, it takes 20 minutes to put everything together and about 2 hours of cooking time. Soak the beans overnight. Bring a big pot of water to a boil and add the beans. Lower the heat to medium and simmer the beans for about 30 minutes. Drain the beans. The beans will still be hard, but you will get rid of the gas-producing compounds. 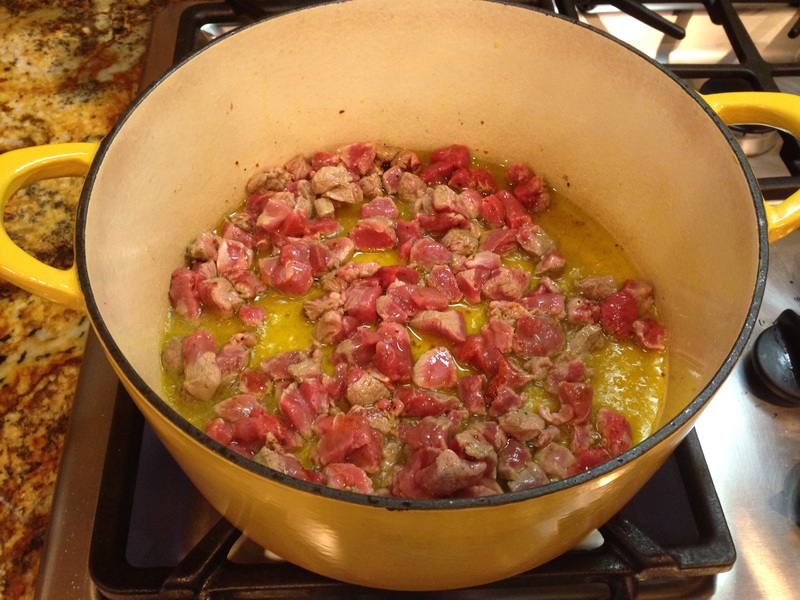 In a big and heavy pot, add olive oil and heat over medium-high. Add the lamb pieces and sauté until browned on all sides, about 5 minutes. Add the onions and garlic and continue to sauté for another few minutes. Next, add the tomato sauce, Worcestershire sauce, sugar, crushed red pepper, salt, black pepper, and bay leaf, lower heat to medium and cover. Cook for about 15 minutes. 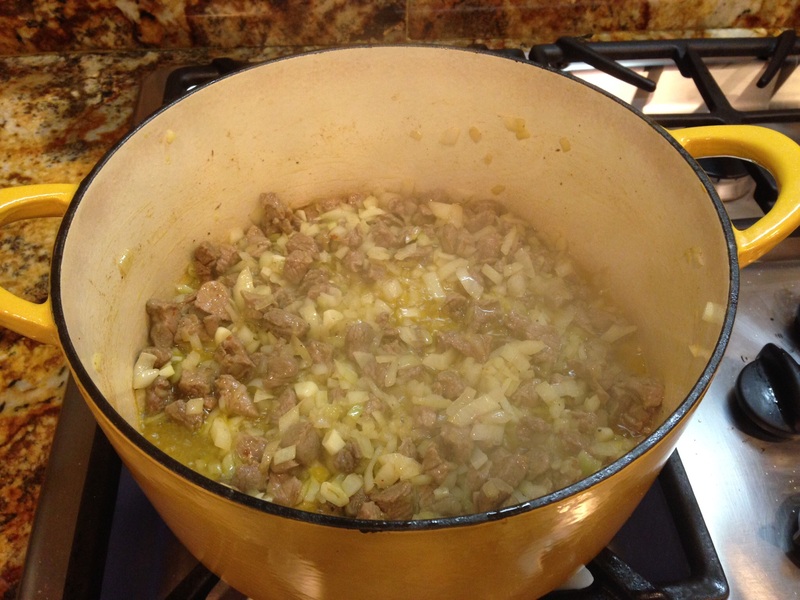 Check the sauce periodically to make sure the bottom of the pot doesn’t stick. If the bottom begins to stick, add a little water. 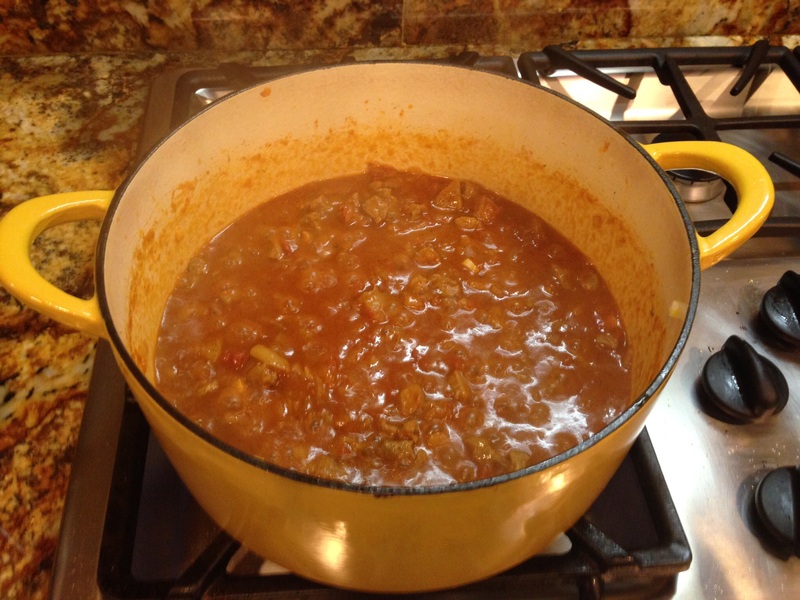 Add the beans and about 2 cups of water to the pot with the lamb and cover. Have the beans cook in the sauce for about an hour on medium heat. Keep checking the beans every fifteen minutes to see whether they are cooked through or more cooking time is needed. One peculiar thing about dried beans is that there is no consistent cooking time. One batch of dried beans may need just 45 minutes to cook, yet another may need much longer. Just keep an eye on it. Again, make sure the bottom of the pot doesn’t stick. Add more water if necessary. Serve with rice. Eat alongside a quartered onion. You won’t have the best breath afterwards, but who cares when it tastes so good!